Arnold Squitieri was as security conscious as Joe Massino. As former FBI agent Joaquin "Big Jack" Garcia originally informed us, in 2002, Gambino crime family acting boss Arnold "Zeke" Squitieri, who was on parole for a drug conviction, had appointed a ruling panel of three mobsters with whom he was especially tight: Alphonse "Funzi" Sisca, Louis Filippelli, and Chris Sucarato were Zeke's official eyes and ears on the street. Acting underboss Anthony Megale was involved with overseeing rackets in the Stamford, Conn. area. (Megale died in the summer of 2015). Squitieri, in his own fashion, allowed personal feelings -- nepotism, basically -- to informally preempt the Gambino crime family's official hierarchy. Louis Filippelli had the most juice out of the three, as he was Squitieri's nephew. However, Filippelli was only a soldier in Gambino capo Alphonse "Funzi" Sisca's crew. Since Sisca was Squietieri's brother-in-law (as well as one of Zeke's buddies) Funzi "officially" had the power -- but Filippelli was the acting boss's official representative during sitdowns and other meetings. Sucarato was then an associate in Funzi's crew; Sucarato also was close to both Filippelli and Funzi. Note: Carlo Gambino's greatest mistake, some say, was his deathbed appointment of a blood family member to be boss. That was Gambino favoring Paul Castellano (perhaps to show his gratitude to the Castellano family, which had assisted the young Gambino when he first arrived here from Sicily). But what Zeke did, favoring relatives and buddies, probably had more to do with trust; he simply trusted the men he knew and was related to, as would most of us, I'd think. 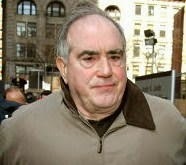 Zeke was sentenced in 2006 for crimes related to the "Jack Falcone" probe. He pleaded guilty to four racketeering charges in Federal District Court in Manhattan. He admitted to threatening construction companies in Westchester County and Mineola, N.Y., with violence in order to extract extortion payments. "I know it was wrong," he said, reading a written statement to a magistrate judge, Michael H. Dolinger. The man referred to as Zeke also told tearful relatives that he had made the plea for them. In a 53-count indictment brought in March 2005, prosecutors charged that in June 2002, Squitieri assumed control as acting boss of the Gambinos once the family's official boss, Peter Gotti, was arrested for racketeering charges. Squitieri refused to acknowledge that he was a member of the Gambino family. He admitted to taking part in an "enterprise," but told the magistrate judge he would agree to a plea only "with the Gambino name out of it." Prosecutors recommended a sentence of seven years to a maximum of nine years, which was less than half the sentence that he might have faced if convicted. Squitieri appeared lively and spoke in a strong voice. But at one point, when the judge asked him during which years he had committed his crimes, he became confused. "I can't remember too good, your honor," he said. "I'm getting up in age." At the end of the hearing, Mr. Squitieri turned to point at his wife, Marie, a slim woman with flowing blond hair, who was sitting with a group of his relatives. "I did it for you," he said. "I pleaded guilty because of you." The arrest of Mr. Squitieri and 31 others followed a three-year probe involving an FBI agent, Joaquin Garcia, who had infiltrated Greg DePalma's crew. F.B.I. officials have compared Garcia to Joe Pistone, aka "Donnie Brasco ," who infiltrated the Bonanno crime family decades earlier. The Times story related an amusing parallel with the Sopranos television show. At one point during the operation, the undercover agent gave flat-screen televisions to Mr. Squitieri and to Mr. DePalma, saying they were stolen, a law enforcement official recounted. One evening Mr. Squitieri was watching an episode of "The Sopranos. " In it, a mobster was watching his own stolen flat-screen set when his parole officer visited and promptly arrested him for possessing stolen property. That episode made Mr. Squitieri, who was himself on supervised release, nervous about the gift, the law enforcement official said. He got rid of the set, the official said, concerned that this "could be life imitating art." Megale, accused as the acting underboss and street operator for Squitieri, pleaded guilty to racketeering charges. Two men admitted they were "street bosses" for Squitieri, Sisca and Filippelli, and pleaded guilty. How Did Lucky Luciano Get that Scar? What the Hell Is the Sacra Corona Unita?